But in 2006, the world was shocked by the passing of Dana Reeve, widow of actor Christopher Reeve. Never having smoked a day in her life, Ms. Reeve died of lung cancer because of her exposure to second hand smoke while working for years as a singer in bars and restaurants filled with smoke. Physicians and researchers believe that passive smoke — the smoke exhaled by others — is potentially even more dangerous than actively inhaled smoke. Just last week, I was taken back by the sudden passing of a friend’s wife from lung cancer. She was 45 and leaves behind two young sons. Another variable is genes. 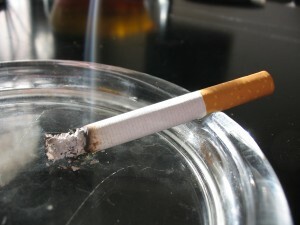 It is clear that some families have a higher occurrence of lung cancer than would be expected. While some of this might be due to shared smoking, some evidence suggests there are certain genes that predispose to lung cancer. In approximately 40 percent of people diagnosed with lung cancer, the diagnosis is made after the disease has advanced. In one third of those diagnosed, the cancer has reached stage 3. So, as a smoker, be courteous and careful to those around you. And as a non-smoker, be aware of the risk of being around smoke, even if you don’t smoke yourself!